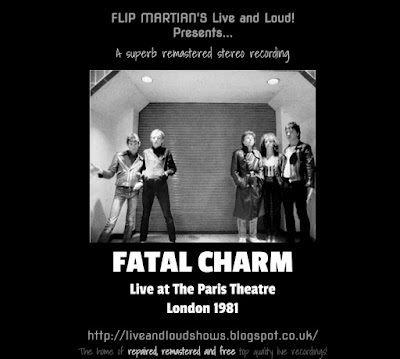 Fatal Charm were formed in 1978 in Nottingham and made a name for themselves in support slots for both OMD and Ultravox in 1980. They continued to write and record in various lineups through the 1980s. I was lent a cassette with this recording on it, along with the 2 tracks from the flexi disc they used to give out at gigs. Those 2 tracks are included on the compilation album "Plastic", which can still be bought from the shop on the band's website, so I've taken them off the recording here. What you have left is this rather short recording from an FM broadcast of excerpts from their 1981 live set recorded at the BBC's Paris Theatre, in Lower Regent Street, London. Anyway, the recording was good quality and hadn't really degraded with age, so no major repairs were needed other than some noise reduction and volume balancing. Then it was out with the trusty 30 band EQ to improve clarity and space between the instruments and improve the bottom end somewhat of what was a rather flat recording; hopefully its a far clearer mix now than it ever was. Special thanks to Dave Barker (Fatal Charm's keyboard player) for clarifying one of the song titles. I remember hearing this set on Radio One when it was broadcast - if I remember correctly, Ultravox were on the same broadcast that evening. They were indeed - I used to have a copy of the show I recorded myself with them on the other side of the tape. Happy to help, glad you enjoyed it; its a great set.